The Mah Meri people are one of eighteen indigenous minority groups in Peninsular Malaysia. The unique Main Jo'oh, their music and dance ritual, is often featured in tourist events, many government-sponsored. While such staged performances support the perpetuation of ethnic identity, the Mah Meri are also subjected to changing levels of hegemony and indigenous agency. I suggest that there is a dynamic interaction between hegemony and agency in Mah Meri staged authentic performances – the hegemony of tourist agents’ touristic concepts, the twenty-first century tourist gaze and the emergence of indigenous agency in sustaining the values and customs in their presentations. Through ethnographic fieldwork, interviews and observations, this article shows examples in which Mah Meri mediated cultural performances, perceived as ‘authentic’ by tourists, were actually shaped by the dialectics of compliance, negotiation and resistance between the Mah Meri, tourist agents and outsiders. This paper promotes a better understanding of the changing meanings of traditional performances recontextualised for stage performances. CHAN SUET CHING, Clare. 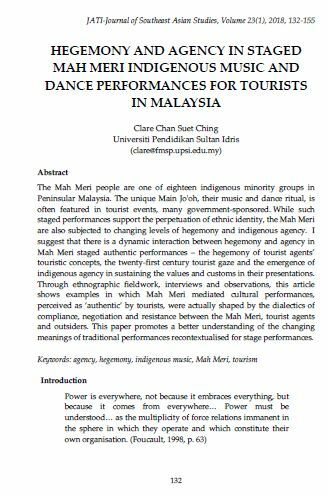 HEGEMONY AND AGENCY IN STAGED MAH MERI INDIGENOUS MUSIC AND DANCE PERFORMANCES FOR TOURISTS IN MALAYSIA. JATI - JOURNAL OF SOUTHEAST ASIAN STUDIES, [S.l. ], v. 23, n. 1, p. 132-155, june 2018. ISSN 2600-8653. Available at: <https://jati.um.edu.my/article/view/12190>. Date accessed: 26 apr. 2019. doi: https://doi.org/10.22452/jati.vol23no1.7.